Soloman is a 3-year-old Moluccan cockatoo. 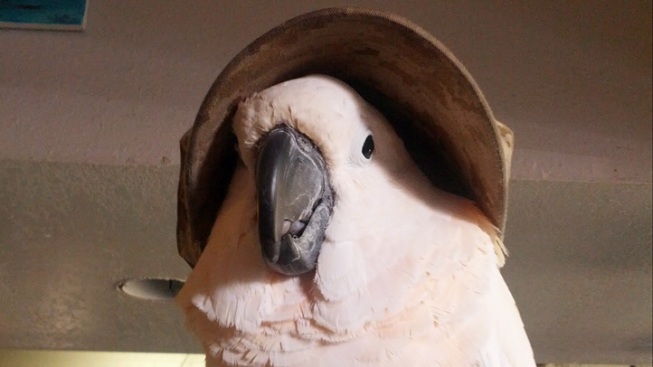 A Temecula woman is asking for the public’s help to find her stolen pet cockatoo, Soloman. Katie Aldrich told NBC 7 that Soloman was stolen Monday at the Haunted Head Saloon in Oceanside. Aldrich says she was sitting outside the bar with Soloman on her lap when a man approached her and started asking questions about the bird. Aldrich said the man suddenly grabbed Soloman and jumped into a red Ford F-150 truck. Aldrich’s husband, a Camp Pendleton Marine, tried to stop the truck, but couldn’t. Aldrich said she's devastated about her missing bird. She said cockatoos can live to be 75 years old. She's hoping surveillance video at the bar will help identify a suspect. Oceanside Police confirmed a report has been filed for the missing bird. Soloman has salmon-colored feathers. Aldrich said he has scoliosis and has a golf ball-sized bump on his back. Anyone with information is asked to call Oceanside Police.